The average homeowner does not already have a professional Orleans roof cleaning company in mind for their pressure washing service needs. This can cause problems because when you finally realize you need one, you may get confused about who to call to get the job done. The last thing that you want to do is just call the first name that you come across without finding out more about their history and customer satisfaction rating. What you will soon find out is that smart homeowners know the name to call on is A to Z Softwash. We work with both residential and commercial clients in order to take care of their pressure washing and roof cleaning needs. The best part is that we use a milder alternative to power washing, which can cause damage to certain aspects of your home. It can be easy to become oblivious to just how dirty your roof is. You see it every day and the dirt is a gradual buildup. The problem is that other become can most certainly see it. Your insurance company could end up canceling your policy if you neglect to get your roof cleaned. If you are unwilling to take preventative steps to avoid your roof from breaking down, they may be unwilling to cover your losses. Roof cleaning is a much more cost-effective alternative to replacing your entire roof. The last thing that you want to do is have to pay for roof replacement long before it should be time when you could simply have it cleaned. Sometimes when we mention softwashing homeowners get concerned that this will not be as effective as power washing. Usually they have been told by someone trying to sell their power washing services that softwashing is too mild. On the contrary, our method is just powerful enough and utilizes cleaning agents as opposed to force of pressurization to get the job done. You end up with cleaner surfaces but without the damage that high velocity water spray can cause. 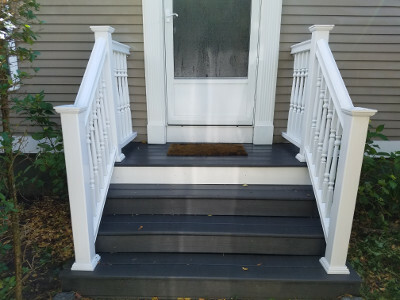 You can rely on us for the perfect use of softwashing or pressure washing in Orleans, MA to get your surfaces safely cleaned. If you own a restaurant then you know the importance of proper hood cleaning. This not only keeps your commercial kitchen clean, it helps reduce the risk of fires in your kitchen. For all of your professional cleaning service needs, you can count on A to Z Softwash. If you are looking for a reliable Orleans roof cleaning or pressure washing professional then please call 508-209-7795 or complete our online request form.